IPFS is a peer-to-peer distributed file system that seeks to connect all computing devices with the same system of files. In some ways, IPFS is similar to the World Wide Web , but IPFS could be seen as a single BitTorrent swarm, exchanging objects within one Git repository. In other words, IPFS provides a high-throughput, content-addressed block storage model, with content-addressed hyperlinks . This forms a generalized Merkle directed acyclic graph (DAG). IPFS combines a distributed hash table , an incentivized block exchange, and a self-certifying namespace. IPFS has no single point of failure, and nodes do not need to trust each other. Distributed Content Delivery saves bandwidth and prevent DDoS attacks which HTTP struggles with. 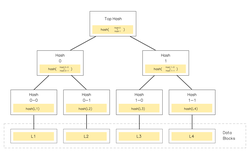 Every Merkle is a DAG because each node is named by a hash algorithm (a One-way function ) which prevents cycles. Each branch of Merkle is the hash of its local contents, naming childs by their hash instead of their full contents. In general for any Merkle, to create a new branch or verify an existing branch, a hash algorithm is used on some combination of the local contents, such as a list of child hashes and other bytes. A few different hash algorithms are available in IPFS. All information for InterPlanetary File System's wiki comes from the below links. Any source is valid, including Twitter, Facebook, Instagram, and LinkedIn. Pictures, videos, biodata, and files relating to InterPlanetary File System are also acceptable encyclopedic sources. The Twitter ​ account of IPFS. The Facebook ​ page for IPFS. The YouTube ​ channel of IPFS. The Google Plus ​ of IPFS. "IPFS README - Who designed it?" "The IPFS Project - How it works"
Other wiki pages related to InterPlanetary File System.